Here are some descriptions of all the enemies in Laser Dolphin - as well as a few tips on how to beat them. Be careful around mines - they do a lot of damage. These blue mines, however, can be easily disposed of by shooting at them. Keep in mind that your enemies can also be injured by swimming into mines - you can use this to your advantage. Red mines are invulnerable against laser blasts. You must rely solely on your navigation skills to get around these. These guns are mounted in walls and they fire once every second. You can either blow them up or just try to time your movement to avoid their lasers. They may look cute, but rest assured that they aren't trying to hug you. These friendly guys swim towards you and explode on contact. Be careful - they do quite a bit of damage. 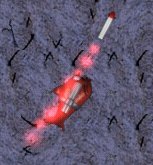 They fire homing missiles that are quite hard to evade. If you want to dodge a missile try doing as follows. Swim towards a wall and make a sharp turn at the last possible second. This will result in the missile hitting the wall instead of you. They fly back and forth dropping bombs as they go. A few shots of laser will take care of these guys. Turrets are quite good at hitting their target. It's usually best to take care of them before swimming out into the open. Drones move back and forth firing their laser periodically. If a drone is out of your range of vision you can usually blow them up by firing in there general direction. Be careful of these guys. They will ignore you unless you fire at them or they see you come too close. You can often simply avoid fighting them altogether. Once they are angry, they do a lot of damage and are tough to destroy. The best way to destroy them is to make them swim into a mine. Robo Sharks are impervious to all known forms of weapons available to dolphins. Your only option is to avoid them by dexterous swimming. If you aren't fast enough they will most certainly bite you. Face yourself. They are equipped with the very same laser as you. They are Laser Dolphin's ultimate most deadly opponent.